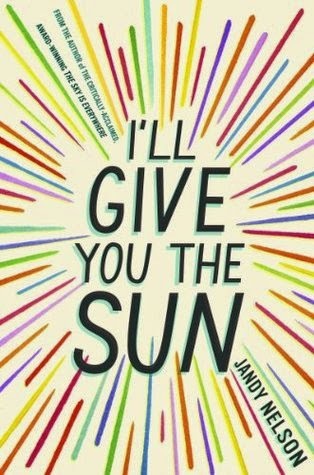 I’ll Give You Sun follows the lives of Jude and Noah, twins who are as different and as close as siblings can be. We first meet them at the young age of 13, when their differing personalities first start to affect their relationship. Noah is withdrawn, constantly immersed in his drawings and discovering feelings for the boy next door. Whereas Jude is turning into a bit of a wild girl, all parties and boys, while also harboring an artistic side she thinks no one appreciates. When a tragedy hits their family, it’s like a switched has been flipped and we see those changes in their 16-year-old selves. Now it’s Noah who is all about being the normal kid at school while Jude is the isolated one, unexpectedly finding comfort in an art mentor and a mysterious boy she meets. What I (surprisingly) loved about the storytelling was that their younger years are told solely from Noah’s POV and the later years are from Jude’s. What they don’t realize is they each literally hold one half of the story and if they would just talk to each other, they’d be free of all this internalized grief they’ve been holding on to. I admit, I had my doubts at first. While the prose was undeniably beautiful and lyrical, I wasn’t sure about the back forth between each twin and between the past and present. I had so many questions. Why was Jude so wild at 13? At what exact moment did Noah decide to be normal? What was really going on in their parents’ minds (both of whom are essential to the story)? Who exactly is this guy mentoring Jude? And is there more to the mysterious boy than meets the eye? I had so many questions and there were moments when I wasn’t sure where everything was headed. Then slowly but surely, all these different layers are peeled away to reveal the truth. We see Noah’s inner conflict regarding his sexuality. We see Jude’s own fears about love, being seen and appreciated. We see their fierce love and their fierce jealousy of the other. There is so much emotion in this book and it comes to a head in a way that is so satisfying and freeing. You know the saying that the truth will set you free? It is so applicable here and the feeling both Jude and Noah experience is palpable. In the beginning, it was a bit slow for me and I had some trouble connecting to the characters. But then it eventually reached a point where it just clicked for me. I do! If you’ve never read any Jandy Nelson’s books, I would definitely recommend doing so. 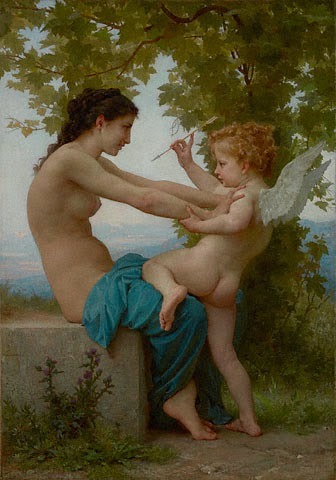 This is my favorite work of art: A Young Girl Defending Herself Against Eros by Adolphe William Bouguereau. I love going to museums and I like to think I have a good appreciation of art. But I won't lie, I admire art on a purely aesthetic level. I like pretty things and certain pieces will definitely move me but I don't always get it, you know? When I saw this at the Getty Museum and it was the first time I saw a painting and just got it. When I looked at this, I didn't just see a girl pushing away cupid. I saw a girl who didn't want to fall in love and that's why she was pushing him away. The message meant something to me then (it was right after my first year in college) and it's been one of my favorites ever since. That's a beautiful piece of art you've chosen! I've never seen it before, but it's something I'd like to see in the future. And, regarding I'll Give You the Sun, well, I thought it was beautiful. It was sad too, but also hopeful, and the mix of everything just had me continuing to turn the pages.